The application provides the ease checking and managing users of an Office 365 domain. The admin can monitor accounts, check Office 365 mailbox size, etc on the single panel. This product shows entire details of all the mailboxes present in the Office 365 tenant. It will offer the name, email address, user quota, and last login details.The Ease of checking mailbox details of Office 365 and managing multiple Office 365 accounts of a particular domain. Moreover, it is possible to search for a specific user and export Office 365 users to CSV file with a single click on Export button. The Office 365 signature management feature of this tool allows the admin to edit/change and create an email signature in Microsoft Office 365 account of multiple users. Email ID, last name, first name, department/country fields can frequently be applied to users of a specific domain. These actions can be performed while users having admin rights or admin handling entire process for Office 365 via management console. The tool allows to create both text and image signatures. The task to apply or modify disclaimer to Outlook 365 emails of all the mailboxes is a bothersome task for most Office 365 administrators. The SysTools Admin Manager utility allows to automatically add a common disclaimer message to all the outgoing emails for entire domain user accounts. With few clicks you can settle a text or image disclaimer to restrict unauthorized users from utilizing any asset of your organization. The Office 365 account management tool allows the admin to extract Exchange Online active users to CSV file format. Also, it offers to create a new user Office 365 account and change Outlook 365 user passwords. Moreover, it offers to export information from user account into CSV file. It provides an option to export Office 365 user name, email address, user quota, and last logon date to CSV file. This software allows to import contacts into Global Address List (GAL) in Office 365. With this tool the admin can add basic details of any external contact via importing a Comma Separated Values file. Importing a CSV file within the application helps in adding multiple/bulk contacts at once. Demo/Free version of Office 365 Admin Manager application can be used for 7 days only and edits/adds only signature as part. Where does your tool saves Admin Outlook 365 account credentials that we enter to monitor/update Office 365 user details? SysTools Office 365 Admin Manager program does not store admin credentials on any of our local database. The utility only uses these credentials to enter into your Exchange Online account so that you are able to edit/manage multiple email accounts of your Office 365 domain on a single software interface. I have user credentials of my Office 365 domain. Can I use it to add user to GAL in Office 365? No, you won't be able to login unless have the admin credentials with you. The software only validates the admin credentials of a Microsoft O365 tenant. I am the admin of my O365 tenant. Can I export Office 365 user last logon date to CSV file using this program? Yes, you can export Office 365 active users to CSV file format using our product. 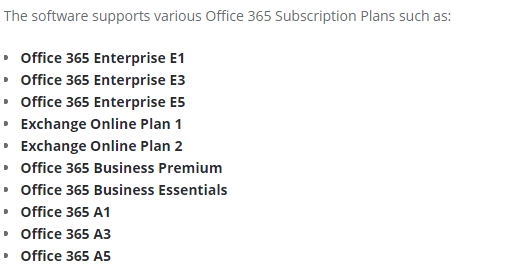 Which are the Subscription plans of Exchange Online supported by Office 365 Admin Manager? Does this software allow to configure/setup image disclaimer in Outlook 365 emails? Yes, you can create image as well as text disclaimer to all the outgoing emails in Office 365. How to add disclaimer to all outgoing emails in Office 365? Please follow the below-mentioned steps to configure/setup disclaimer in Office 365. 2. Click on “Disclaimer” to apply a default disclaimer message to all the outgoing emails. You can add text as well as images to your message. Click on Save once you are done. 3. You will receive a successful completion message. Click on OK.
How to create an email signature in Microsoft Office 365? The following are the steps to set default signature in Office 365 using SysTools product. 2. Click on “Signature” to add signature to email in Outlook 365. You can add texts and images to the signatures. You can also insert contact fields by which you can apply signature. The contact fields available are First Name, Last Name, Display Name, Email ID, Department, and Country. After you are done, click on Save. I want to know how to insert image in signature in Outlook Office 365 for all the mailboxes? Can this be done using this application? Yes, adding picture to signature in Office 365 is possible using our tool. The admin can create a common signature with an image for all the Outlook 365 mailboxes of a single domain. One of the best tool to add users to Exchange Online and monitor Office 365 mailboxes at the same time on the single and simple interface. I am amazed by the numerous features provided by this utility in just $499. It has made my work life very easy. Thanks! Quite impressed with the facility provided to add external contacts to Global Address List in Office 365 using just a single CSV file. According to me, this is one of the best feature of this very efficient application. Amazing software to bulk edit Office 365 users. Great job done, guys! One of the best solutions to update/modify Office 365 user details and access as well as check office 365 mailbox details on the software interface. I like the “export Office 365 users to CSV file” feature of this software. Kudos to the development team! Being able to create/update Outlook 365 user accounts and add user to GAL Office 365 is the part of my job profile. Being able to do half of my work using this application is wonderful. 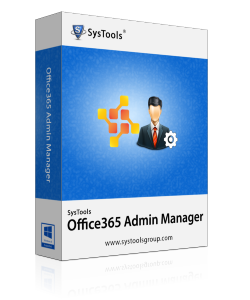 SysTools Admin Manager product is one of the best software I have used to manage multiple Office 365 email accounts. Thanks for this exceptional solution.